Geologists have been predicting since the 1950s that oil production would begin to decrease in a matter of decades. When Geophysicist M. King Hubbard predicted in 1956 that oil production in the U.S. would peak in the early 1970s, both the scientific community and the public made him a pariah. 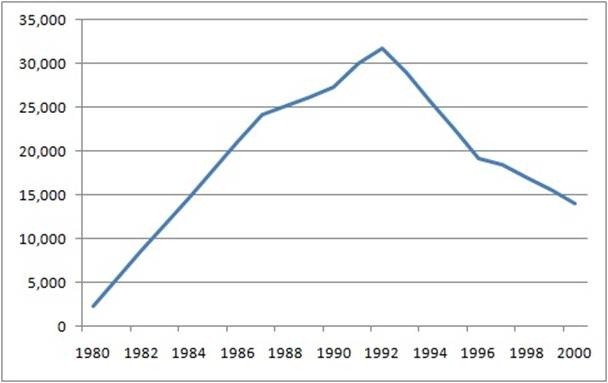 However, when production peaked in 1970 as he predicted (Figure 1), many scientists accepted him as a prophet (most of the public remained unaware of his predictions). Many people forget that until the early 1970s the U.S. was, like Saudi Arabia of the 1980s and 1990s, the largest oil producer in the world. However, since the early 1970s the U.S. has become increasingly dependent on foreign countries like Saudi Arabia to feed its voracious appetite for oil. We now rely on unstable third world countries to fuel our cars, and we finance despots and wars to maintain our precious oil supply. Even George W. Bush acknowledged in 2008 that the U.S. is addicted to oil. The effects on foreign countries of the U.S. addiction to oil are very similar to the effects of the U.S. addiction to illegal drugs: the flow of money from the wealthy U.S. leads to corruption, crime, and political instability in third world countries. Our addiction has caused scores of countries and millions of people to suffer. Moreover, our dependence on foreign countries for oil has obviously decreased our national security. Figure 1. 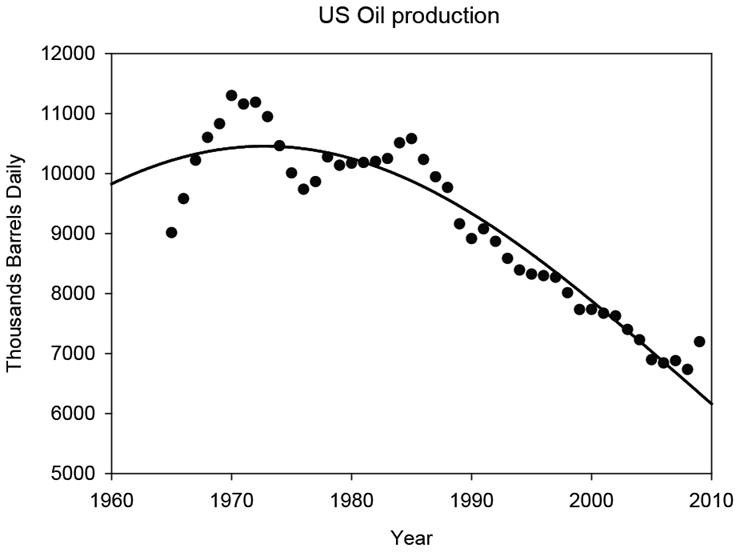 U.S. oil production over time. Equation for Gaussian fit: y = 10955*exp(-0.5*((x-1972.8)/36.21)^2). Data from BP Statistical Review (2010). Now that the U.S. depends on foreign countries for 2/3 of its oil, we must be concerned not only about the reliability of our existing suppliers but also the natural limits to global oil production. In the year 2008 the world experienced for the first time a spike in oil and gas prices resulting from demand, as opposed to previous price spikes in 1973, 1980, and 1990 caused by global conflicts. Increases in oil prices result in increases in the costs of farming and food. The spike in 2008 occurred because countries didn’t allow the market to correct itself; instead, for decades they subsidized energy and food, keeping prices artificially low ((Friedman 2008), p. 41). 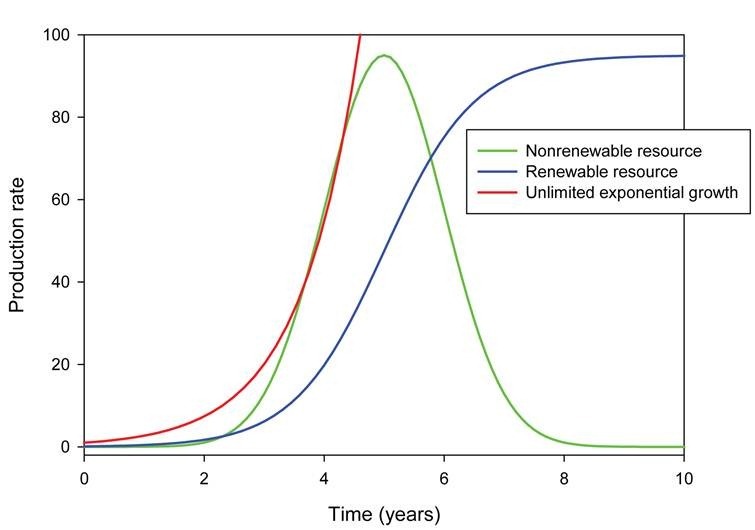 To understand better why we can expect to have future shortages of non-renewable resources such as oil, we refer to (Figure 2), which plots hypothetical production rates of renewable and nonrenewable resources as a function of time. As discussed previously, because there is a finite amount of every nonrenewable resource such as oil, production and consumption inevitably lead to resource depletion. The total amount of a resource that is available (the ultimate cumulative production) is equal to the area under the curve. Resources that are not abundant and that we use rapidly run out quickly so that their resource production curves are very narrow. Resources that we use slowly or that are abundant last much longer, so their curves are wide and do not peak until well into the future. Figure 2. Hypothetical production rates as a function of time. After Hubbert (1987). We can apply Hubbert’s approach of constructing resource availability curves to any non-renewable resource on either a local or a global basis. Many countries are already post-peak for production of oil (including the U.S.) and other resources. For example, the U.S. imports 100% of the following resources that it uses: Arsenic trioxide, asbestos, bauxite and alumina, columbium (niobium), fluorspar, graphite, manganese, mica, quartz crystal, strontium, thallium, thorium, and yttrium (Keller 2011). Because we have global trade, local scarcity has not resulted in a crisis. Countries that have a surplus of a resource export it, and countries erase their deficits by importing. The problem occurs when global annual production rate of a nonrenewable resource peaks and then begins to decline. During the decline, resource production cannot keep pace with demand, and resource prices rise. Peak oil may cause shortages of many other resources because oil provides the energy to transport those resources. If the U.S. doesn’t have oil to transport all of the resources that we import, we will have more than just an energy problem. What nonrenewable resources may become scarce in the 21st century? Hubbert predicted that copper, tin, lead, and zinc would reach peak production within decades (Hubbert 1987). At the current rate of consumption, these metals will be available for 60, 40, 40, and 45 years respectively, and Indium, which is used in LCDs and solar cells, may run out in only 15 years (Ragnarsdottir 2008). Phosphate, which is an essential component of fertilizers, may disappear within the next 60-70 years (Oelkers and Valsami-Jones 2008), which could greatly decrease agricultural productivity and cause widespread food shortages. It’s not just non-renewable resources that we have to worry about. Certain types of renewable resources have production curves similar to those of non-renewable resources because their renewal rate is less than the harvesting rate. For example, deep (fossil) groundwaters have been in the ground for hundreds or thousands of years, which means it would take hundreds or thousands of years to replace them at natural recharge rates. In many areas of the world, the groundwater extraction rate is much greater than the recharge rate, so the groundwater reserve is shrinking, as made visible by falling water tables in unconfined aquifers. When we use groundwater and other resources faster than they can be replaced, we are effectively mining them, and we can expect the production rate to peak and then decline, as occurred in Saudi Arabia (Figure 3). Consequently, hydrologist Luna Leopold advocated the treatment of groundwater as a nonrenewable resource that we should use only during droughts. The sustainable approach to resource use is not to use renewable resources faster than nature can renew them. Figure 3. Saudi Arabia Water Supply 1980-2000 in Million cubic meters/year. Data from Abderrahman (2001). Another renewable resource whose production has peaked is the global wild fish catch, which peaked in the 1980’s due to overfishing (Fig. 1.10). Fortunately the use of aquaculture as a substitute is expanding, which has softened the blow. As human population and resource demand continue to increase, we can expect to see the production of more resources peak and then begin to decline. The important question is, will we always find adequate substitutes as we did for marine fish? Oil production is now declining in 60 of the 98 oil-producing countries. Most of these countries had a peak in oil discovery 30-40 years before they reached peak production. Similarly, we can expect world oil production to peak 30-40 years after world discovery rates peaked in 1965. World oil consumption has outpaced the discovery of new oil reserves for almost three decades: we now consume four barrels for every one we discover. Discoveries of oil total about two trillion barrels worldwide, and we already used ~one trillion barrels. That puts us at the center of the production curve where the peak is (often called “Hubbert’s Peak”), so that when we start consuming the second half, production rates will decrease and prices will rise (the curve is symmetrical, so the peak is in the center and the area under the curve to the left of the peak is the same as to the right of the peak, corresponding to one trillion barrels). Furthermore, the first trillion barrels was the oil that was easy to get out of the ground; the second trillion barrels will become increasingly more difficult to mine. 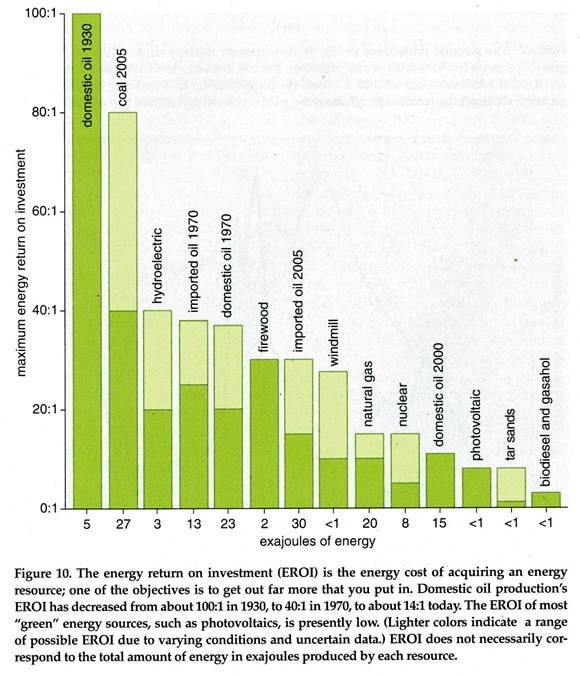 The EROEI (Energy Return On Energy Investment) will steadily decrease, and the amount of environmental damage associated with oil recovery will greatly increase. Andrew Nikiforuk gives good evidence that the world is nearing peak oil in his book “Tar Sands: Dirty Oil and the Future of a Continent” (Nikiforuk 2008). He notes that the biggest supplier of oil to the U.S. is no longer Saudi Arabia, but our next-door neighbor Canada. U.S. citizens are happy because there is less risk that money we spend on oil will end up in the hands of terrorists who target us. However, Canadian oil primarily comes from the Athabasca tar sands in Alberta, and mining of this “dirty” oil creates huge environmental problems, including much higher CO2 emissions per unit energy because large amounts of natural gas are used to refine this dirty oil. Production of tar sand oil emits roughly 100 to 650 pounds of CO2 per barrel, compared with North Sea oil that emits only ~20 pounds per barrel. Nikiforuk (Nikiforuk 2008) calls this “a switch from bloody light oil to dirty heavy oil,” and concludes that it is not in the best interests of the U.S. or Canada. 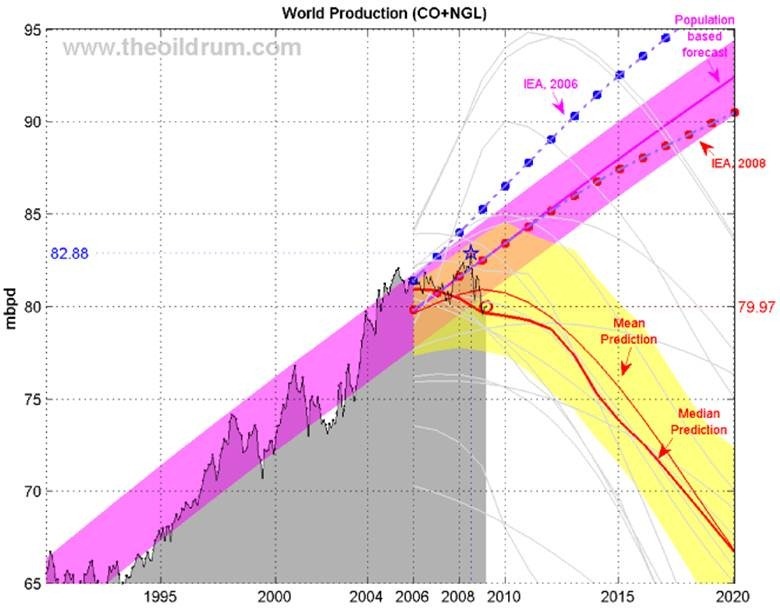 Several other observations support the idea that global peak oil is near. First, of the 98 oil-producing nations, 60 have already passed their peak (Hopkins 2008), including the U.S., U.K., Norway, Venezuela, and Russia; countries near their peak include Saudi Arabia, Mexico, and China; and countries where production is increasing include Canada (tar sands), Kazakhstan, and seven others. Second, although prices have been very high, giving an incentive to increase production, the production rate has remained steady at 84-87 million barrels per day for the last six years (Figure 4). The evidence is that geology rather than economics or politics dictates production rates. Third, oil companies are drilling in more difficult environments because they have already tapped out the easy targets. For example, the BP oil spill in the Gulf of Mexico in May 2010 resulted from the extreme pressures below one mile of ocean and four miles of rock where they were drilling. Another supporting observation is that oil companies have not greatly expanded their oil exploration activities even though the price of oil has skyrocketed. Oil companies are now using their vast amounts of money to diversify or buy back their own stocks rather than spending more money on R&D and exploration. This is clear evidence of falling return on investment in exploration, and shows that oil companies are planning for reduced oil production. Figure 4. World oil production in thousands of barrels daily. Gaussian fit predicts peak production in the year 2026 (y = 85079*exp(-0.5((x-2026)/51.94)^2). Data from BP Statistical Review of World Energy Data 2010. So when will global oil production peak and then begin a steady decline leading to increasing cost? Oil companies and national governments want investors to be optimistic about the future, so they try to discredit peak oil claims. To get the true story we need experts who are independent of corporate or government interests, who have no personal stake so their opinions are objective, and who base their opinions on facts. Kenneth Deffeyes (2001) argued that the peak would be somewhere close to the year 2005. Using data from British Petroleum’s annual Statistical Review of World Energy 2010, I plotted world oil production through 2009 (Figure 4). The data show that oil production plateaued starting in 2005. The increasing gap between constant supply and increasing demand fueled by countries like China and India caused oil prices to increase dramatically by 2007 before falling in response to the global recession. A Gaussian fit to the production data peaks at 2026[i] (Figure 4). 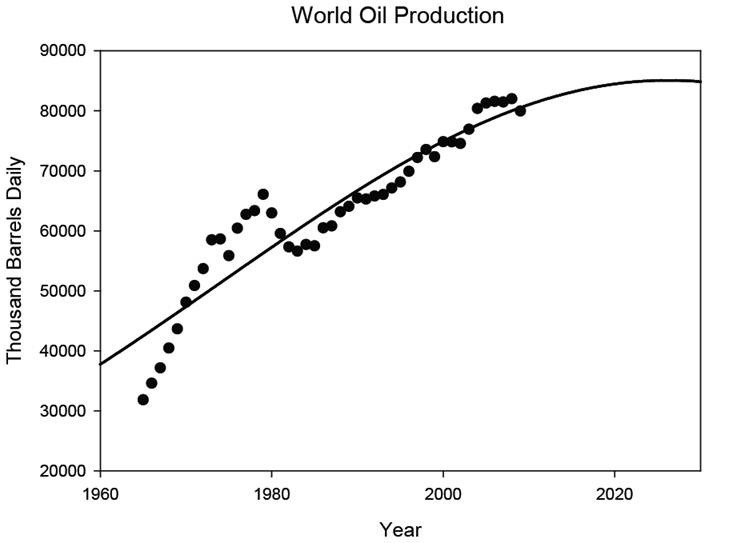 Most other studies that tried to fit the production data and extrapolate it into the future suggested that oil production would peak near 2008-2010 (Figure 5, from http://www.theoildrum.com). Considering that oil production has not increased significantly since 2005, and actually dropped 2.6% from 2008-2009 (BP 2010), these predictions seem accurate. However, as Hopkins (2008) points out, the exact date of the peak doesn’t matter; what matters is that it is near, and we haven’t begun to prepare for it. Figure 5. World oil production (EIA Monthly) for crude oil + NGL. The median forecast is calculated from 15 models that are predicting a peak before 2020 (Bakhtiari, Smith, Staniford, Loglets, Shock model, GBM, ASPO-[70,58,45], Robelius Low/High, HSM,Duncan&Youngquist). 95% of the predictions sees a production peak between 2008 and 2010 at 77.5 – 85.0 mbpd (The 95% forecast variability area in yellow is computed using a bootstrap technique). The magenta area is the 95% confidence interval for the population-based model. According to the U.S. Department of Energy, “The world has never faced a problem like this. Without massive mitigation more than a decade before the fact, the problem will be pervasive and will not be temporary. Previous energy transitions (wood to coal and coal to oil) were gradual and evolutionary; oil peaking will be abrupt and revolutionary” (Peaking of World Oil Production: Impacts, Mitigation & Risk Management, February 2005, Page 64). What is crazy and wasteful is that the U.S. and other countries are still building car assembly plants, roads, highways, parking lots, suburban housing developments, and airplanes as though cheap oil will last forever (Brown 2009). We continue to make investments in an infrastructure that will be superfluous shortly after we build it. This is an example of a market that is failing because it does not anticipate even short-term changes. Many will dispute the assertion that world oil production has nearly peaked. It is possible that the current peak apparent in (Figure 4) is a local maximum rather than a global maximum. Examples of local maximums include the 1973 and 1980 peaks in world oil production followed shortly after by price increases. Both of these local maxima resulted from political events, the OPEC embargo in 1973 and the Iraq-Iran war in 1980. So while resource availability is the primary control, anything that disrupts production and transportation of oil (wars, natural disasters, and politics) can cause short-term fluctuations in production rates and therefore price. However, the current oil production peak is not caused by political events, but by the inability of producers to increase supply. Others argue that oil production, or at least combined conventional and unconventional oil and gas, will not rapidly decline but will plateau or slowly decline (Cheney and Hawkes 2007). Production of conventional oil and gas may decline steeply. However, substitution with unconventional oil such as tar sands combined with improvements in extraction technologies will slow the rate of production decline for combined conventional and unconventional oil and gas, consistent with the nearly constant production rate of the last six years. Even in this best-case scenario where world oil production plateaus rather than peaks, oil prices will still climb considerably because demand will continue to increase exponentially as the economies of China and India expand at an exponential rate. As noted by Lester Brown, in this era of globalization “where oil production is no longer expanding, one country can get more oil only if another gets less (Brown 2009)”. The U.S. will be competing with China, India, and every other country in the world for oil, which will drive up oil prices. Some think that increasing domestic production will solve any oil shortage problems for the U.S., but in reality, oil companies will sell any domestically-produced oil on the global market. Despite political claims to the contrary, if the U.S. opened the Alaskan National Wildlife Refuge (ANWR) to oil drilling today, when it reached maximum production in roughly 2030 it would supply no more than 1.2% of the total world oil consumption[ii], and therefore would have a negligible impact on oil prices. Furthermore, oil production could not begin until roughly ten years after opening ANWR (yes, it takes that long to build the pipeline, drilling facilities, etc. ), and would peak around 2030 before starting to decline, so it won’t help the U.S. for at least ten years. So no, opening ANWR will not solve our oil problem. The most important question about oil is not how much remains in the ground, but how much can we mine and still maintain economic and energy profits (Hall and Day (2009)). We get an energy profit when we get more energy from the oil we produce than the amount of energy required to produce it. The Energy Return On Energy Investment EROEI of U.S. petroleum declined from roughly 100:1 in 1930, to 40:1 in 1970, to about 14:1 in 2000 (Hall and Day (2009)). For the tar sands that produce a major amount of oil consumed in the U.S. the ratio is much less than 10:1, perhaps even close to 1:1 (Figure 6). As EROEI decreases, the cost per unit energy increases. Increases in EROEI, supply-demand gap, and price of petroleum will also cause increases for gasoline, because gasoline is produced by distilling oil in a refinery. Gasoline is an amazing substance that we take for granted. Each gallon of gasoline contains 37 kWh of energy, which is equivalent to 500 hours of human work[iii] (http://www.lifeaftertheoilcrash.net/Research.html). In other words, you could hire 500 people to push your car for one hour and it would get you roughly as far as one gallon of gasoline. Currently that gallon of gasoline costs about $2.50, but to hire 500 people to push your car for one hour at a typical wage of $10/hour would cost you $5000. People say gas is too expensive? It’s the bargain of the millennium, which is why people are burning through it so quickly. In most countries gasoline is more expensive than in the U.S.. Iran and Venezuela have anomalously low prices because they are petroleum-producing countries with government-controlled pricing. European countries have much higher prices due to heavy government taxation. Thus, high gas prices are a global problem caused by oil scarcity, and are not caused by a U.S. infrastructure deficiency. We conclude that oil is becoming scarce, that exploration and enhanced recovery are unlikely to relieve that scarcity, and that oil prices will continue to rise as demand increases. BP (2010). Statistical Review of World Energy 2010, British Petroleum. http://www.bp.com/productlanding.do?categoryId=6929&contentId=7044622. Brown, L. (2009). Plan B 4.0: Mobilizing to Save Civilization. New York, NY, W.W. Norton & Co., Inc.
Cheney, E. S. and M. W. Hawkes (2007). “The Future of Hydrocarbons: Hubbert’s Peak or a Plateau?” GSA Today 17(6): 69-70. Deffeyes, K. S. (2001). Hubbert’s Peak: The Impending World Oil Shortage. Princeton, New Jersey, Princeton University Press. Friedman, T. (2008). Hot, Flat, and Crowded: Why We Need a Green Revolution – and How It Can Renew America, Farrar, Strauss and Giroux. Hall, C. S. A. and J. W. J. Day (2009). “Revisiting the Limits to Growth After Peak Oil.” American Scientist 97: 230-237. Hopkins, R. (2008). The Transition Handbook: from oil dependency to local resilience, Chelsea Green Publishing. Hubbert, M. K. (1987). Exponential Growth as a Transient Phenomenon in Human History. Societal Issues, Scientific Viewpoints. M. A. Strom. New York, NY, American Institute of Physics: 75-84. Keller, E. A. (2011). Environmental Geology, Pearson Prentice Hall. Nikiforuk, A. (2008). Tar Sands: Dirty Oil and the Future of a Continent. Vancouver, BC, Canada, Greystone Books. file:///C:\Users\ayersj\Documents\My%20Classes\Sustainability\Papers\TarSandsBook.pdf. Oelkers, E. H. and E. Valsami-Jones (2008). “Phosphate Mineral Reactivity and Global Sustainability.” Elements 4(2): 83-87. Ragnarsdottir, K. V. (2008). “Rare metals getting rarer.” Nature Geoscience 1(11): 720-721. http://www.nature.com/ngeo/journal/v1/n11/pdf/ngeo302.pdf. [i] According to Deffeyes (2001), production values for nonrenewable resources such as oil are best fit using the Gaussian or normal distribution y=a*exp(-.5*((x-x0)/b)2). This equation has three adjustable parameters: the year of peak production (x0), the amount of oil produced daily during that peak year in millions of barrels (a), and the number of years between the half-maximum points (b). I used the Solver add-in in Microsoft Excel 2010 to minimize the sum of the squares of the residuals (= predicted – measured), known as the chi-squared statistic, by automatically adjusting the values of the three parameters until I obtained the best fit values for global production of a = 85.0, b = 51.9, and x0 = 2026, with r2 = 0.87. I obtained the same results using nonlinear regression in Sigmaplot 11. The calculated peak production of 85 million barrels per day is roughly equal to the production rate from 2007-2010. [ii] Fear of oil shortages has led to the spread of misinformation, particularly for political gain. Recently a friend said he had heard from several sources that ANWR can supply about 60 years of oil for the U.S.. I told him that I had heard that, given our current oil consumption rate, it was more like a two -year supply (if it were our only source of oil), and that to last 60 years ANWR would have to contain more oil than Saudi Arabia ever had. That night I looked up the statistics. According to the USGS (2001) ANWR holds roughly 10.4 billion barrels. In 2007, the United States consumed 7.54 billion barrels of oil. Thus, it would take only 10.4 bbl/7.54 bbl/year = 1.38 years for Americans to consume all of the oil. For the maximum estimate of 16 billion barrels of oil in ANWR it would take 16/7.54 = 2.1 years. Considering our rate of consumption of oil is continuously increasing, an estimate of two years supply is a reasonable upper limit. This entry was posted in Energy, Fossil fuels, Peak Oil, Resources, Sustainability and tagged Energy, Fossil fuels, natural resources, Peak Oil, Sustainability. Bookmark the permalink.